Based on how much the fans watching NASCAR on TV seem to hate this technology I doubt it'll be around any longer than the glowing puck in televised hockey. So be sure to check out Draft Track while you still can. It displays graphics that are supposed to represent airflow over and behind race cars. Yellow indicates down force and drag, and blue shows the turbulent air in a car's wake. I haven't yet been able to tell if this is real data being displayed, or only a simulation. I imagine they could do it with some sort of doppler radar, but I don't believe the resolution on current systems is good enough. It's ultra cool if it's real data, and a bit dorky if not. Back when I was working on ion accelerators in the lab, we never had enough of these around. It'll probably be a problem until we finally switch to the metric system altogether. 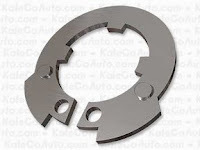 KaleCo, the company that sells them, mostly supplies car tools, parts and accessories. 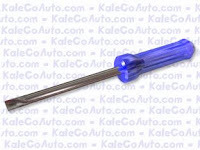 They point out that the screwdriver is perfect for "loosening screws on the right side of the vehicle, or tightening screws on the left side of the vehicle." Another item that would come in handy for all those seemingly never-ending experiments would have been a few of these round tuits. I can't tell you how many technicians have told me they would finish a job if they could only get one. I had no idea they cost $125.99 (plus shipping)! Maybe that's why they were so hard to find. What do you get when you combine a merry-go-round and the boundless energy of kids? At least in South Africa, Mozambique, Swaziland and Zambia where over 2 million people are benefiting from the installation of PlayPumps. In a creative effort between scientists, community leaders, advertisers, and many others, the pumps, driven by spinning a merry-go-round, are bringing new freedom. People that once had to walk up to 5 miles to water can now turn on a tap at the village center. Girls have the time to go to school and women can spend their extra time growing vegetables, starting businesses, and caring for their children. The International Physics Olympiad competition is on in Isfahan, Iran right now! 76 countries sent 340 of their brightest high school physics students to compete. They were welcomed to Iran Friday, July 13th, with opening ceremonies held Saturday morning. 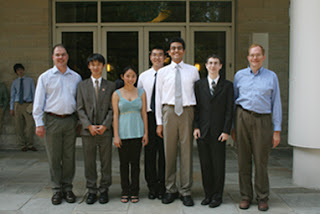 US Physics Olympiad team and coaches. From left, Paul Stanley (coach), Rui Hu, Jenny Kwan, Haofei Wei, Kenan Diab, Jason LaRue, Robert Shurtz (coach). Kenan Diab, Jenny Kwan, Rui Hu, Haofei Wei, and Jason LaRue are representing the US at Isfahan University. Since their arrival, they have taken a theory exam, visited the Persian Gulf and walked about town, braved the searing heat of up to 120°F, feasted on kabobs, and enjoyed an introduction to Iranian culture. But you don't have to take my word for it. The team (or, largely the coaches) have been recording their activities in a blog. They took the theory exam on Sunday and finished the experimental exam today, so it's a little late to be wishing them luck, but they'll have a few more adventures in Iran before heading back home on July 22nd. I'll post more when I find out how they did. As last year's team took home four gold metals and one silver, they have big shoes to fill. They are a wicked smart bunch, though, so expect great things. Jupiter is visible! Well, at night it is. It's been hovering right over Scorpius, low in the southwestern sky. This is quite exciting for me because it is the first time that I have known a patch of the night sky well enough to recognize that one "star" didn't belong. Naturally, I was filled with nerdy excitement and had to look online to figure out what exactly I'd seen. Jupiter was my best guess, and by Jove, I was right. This nifty Planet Finder helped me confirm it. Apart from the turbulent atmosphere, Jupiter has a pretty sweet magnetosphere. Particles from the solar wind, the volcanic eruptions from the moons, and Jupiter's own atmosphere get trapped into the magnetic field generated by eddie currents in the metallic layer of liquid hydrogen (where the electrons can move freely) in Jupiter's core. 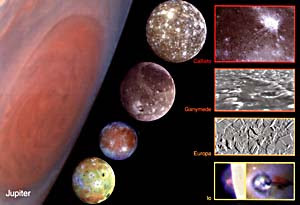 The volcanic moons like Io, Ganymede, and Europa move through the magnetosphere, creating a spectacular aurora. 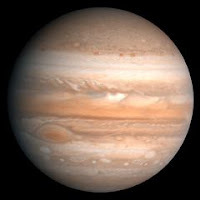 If you get a chance to visit an observatory while Jupiter is out, go for it. 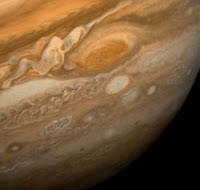 You will probably be able to see the lines on the planet's surface and maybe even the Great Red Spot. Anyway, I encourage y'all to check it out. Personally, I'm going to get myself a little telescope. While I can't afford one fancy enough to see details of the planet's surface, perhaps I can catch a glimpse of the Galilean moons! Find an observatory near you! If nothing comes up for your city, just enter your state. All from NASA through Wikipedia. The 2007 Summer X-Games are ramping up. Skateboarding, surfing, rally car racing, motocross and freestyle motocross (FMX) - that's what I call physics in action. My favorite sport is the skateboarding, but freestyle motocross is a close second. Last year, Travis Pastrana landed the first double backflip ever in competition at the 2006 X-Games. Check out this Youtube clip of Travis pulling off a double to win the best trick competition. That's pretty cool, but you may be thinking (as I did), what's the limit to this backflip stuff? Triple backflips? Quadruple? Quintuple? It turns out, based on the physics involved, that the most you can ever expect to see in FMX is a quadruple backflip. To see why this is the limit, check out the first posting in my brand new blog Extreme Sports Physics. As "Demick" poetically phrased in the above haiku, calculations that demonstrate missing masses in galaxies and larger-than-expected gravitational forces point to a mysterious dark matter. It seems to concentrate in halos around galaxies. The Bullet Cluster, two colliding galaxies which provide the best evidence yet for dark matter. Its particles scarcely notice the matter in our everyday lives. In fact, they hardly interact with the matter that makes up everything that we can see in the universe. So how do we figure out what it is? Well, that’s rather a large problem. Luckily, theoretical physicists like Erik Lundström, Michael Gustafsson, Lars Bergstrom, and Joakim Edsjo of Stockholm University are on the case, tracking down the cause of the unexpected mass and gravity. Weakly Interacting Massive Particles (WIMPs) are a hypothetical form of dark matter that interacts only through the weak and gravitational forces. As a result, they create the gravitational effects that we observe without emitting light or accumulating into larger objects like asteroids, planets, and stars. Back in 1970s, particle known as the inert Higgs boson was proposed. It is the subject of renewed interest in part because its presence could help explain dark matter and allow for a higher Higgs mass. An inert Higgs may seem to stretch the imagination since the ordinary Higgs boson has not yet been discovered, but it also suggests a reason why the Higgs hasn’t been observed. If the inert Higgs boson exists, the ordinary Higgs could have a mass more than twice that of the top quark, the heaviest particle on record. The ordinary Higgs particle is the last missing piece in the Standard Model. According to the theory, a Higgs field exists through all space. Particles gain mass through their interactions with this field. Just as photons make up electric and magnetic fields, the Higgs field is composed of Higgs bosons. A simulation of a Higgs event -- these are the tracks that would be left in the detector by particles resulting from the decay of the Higgs particle. Physicists have been trying to hunt down the Higgs nearly two decades. In my experience, many physicists whose work does not concern large colliders are rather cynical about the existence of this elusive particle. Experiments have shown that its maximum mass is well within the range particle masses that existing colliders such as Fermilab's Tevatron can produce. Many believe that if it was going to be found, they should have found it by now. Even so, the Higgs particle would interact so weakly with other particles that it is very difficult to detect. While the Higgs may still have a lower mass, the existence of the inert Higgs would allow for the mass of the ordinary Higgs to be higher than currently achievable collision energies, offering an explanation for why it has not yet been discovered. One of the major projects of the Large Hadron Collider, or LHC, which is to go online in 2008, is the search for the Higgs boson. (Given the delays in the start-up, the race is on for researchers at Fermilab to find the Higgs before LHC can!) They will also search for dark matter in collisions 14 times more powerful than the Tevatron. The inert Higgs is inert because won’t interact with many other particles. It’s a downright snob as particles go. However, it will mingle with the ordinary Higgs boson, and through those interactions can have a small impact on other particles. It will also interact weakly with other bosons called W and Z. An inert Higgs wouldn’t be caught dead hanging out with quarks, which make up the familiar protons and neutrons. They also avoid leptons such as the electron. Neither do they get along with their own kind. In fact, an inert Higgs is its own antiparticle. When two inert Higgs bosons meet, they’ll annihilate. Matter-antimatter annihilation, resulting in 2 photons. E = mc2. The energy of the photons is determined by the mass of the particles and the speed at which they collided. 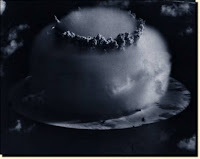 Other particles may be produced provided that the energy from the annihilation is enough to create the necessary mass. 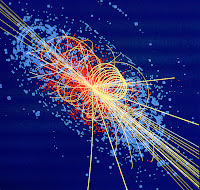 Inert Higgs particles can annihilate another way, resulting in a Z boson and a photon. Gamma rays are photons with a lot of energy, much more than visible light, and the photons from either type of inert Higgs annihilation will have energies in the gamma range. Photons from these annihilations would have very specific energies which would make striking peaks in a graph of gamma ray energies. In a recent article submitted to Physical Review Letters, the Stockholm team reported the gamma energies that may result from annihilations of inert Higgs particles. The current detectors in space are not capable of catching the gamma rays that would result from inert Higgs particles running into one another. However, a new telescope called the Gamma-ray Large Area Space Telescope (GLAST), to be launched in January of next year, is able to detect these rays. GLAST, illustrated. The rectangular chunk on the left is a close-up of one of the segments. Lundström and Gustafsson anticipate its launch. If the telescope detects the spectrum produced by inert Higgs, then we'll know what some of this dark matter is made of. It will also reopen the possibility of a heavy Higgs boson, but that probably won't keep skeptical physicists from scoffing. This is so fabulous that I had to borrow it from Daily Mail, which I stumbled upon through Tommaso Dorigo's A Quantum Diaries Survivor. Curtis Ebbesmeyer with whimsical world travelers. Sometimes science starts with an accident. 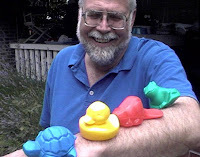 In this case, 29,000 plastic bath toys -- yellow ducks, blue turtles, green frogs, and red beavers -- were tossed into the Pacific by a January storm back in '92. The waterlogged cardboard packaging fell apart, setting the plastic critters free. A retired oceanographer by the name of Curtis Ebbesmeyer has tracked their journeys from the eastern Pacific Ocean. An estimated 19,000 of the toys headed south, landing in Australia, Indonesia, and South America. The other 10,000 turned northward, getting trapped in the ice of the Bering Straits and traveling eastward at the crawling pace of a mile a day. The first of these intrepid duckies was found thawed on the eastern side of the US in 2003. Now, after four years traveling down the North American coast and turning back northward, they are due to wash up on the western coast of Britain. How cool is that?